Whaddon has a Whitsun tradition seemingly unlike any other in the UK. At some point in the past, a practice developed of men going round the village singing a special song around the village on and around Whitsun time. These men held aloft oak branches, and waved them at various points. This tradition fell out of use in the early 20th century. However, knowledge of it was kept alive in the village, and it was revived in a slightly updated form in 2005. A summary of what is known about the song and how it was revived will be found on the About the tradition tab below. For readers not accustomed to the British term Whitsun , it is a name used to refer to the Church festival of Pentecost, seven weeks after Easter Sunday. Whitsun comes from White Sunday , which has several possible origins, one of which is that white vestments were worn by the clergy on that day. See Wikipedia. The date of Whit Sunday varies each year, as it is tied into Easter and Lent. It is very important to remember that it is NOT necessarily the late May Bank Holiday weekend (still erroneously called Whitsun by many). This year we are back to the "usual" format of having a folk evening on the Saturday as a curtain-raiser to the main events on Sunday. 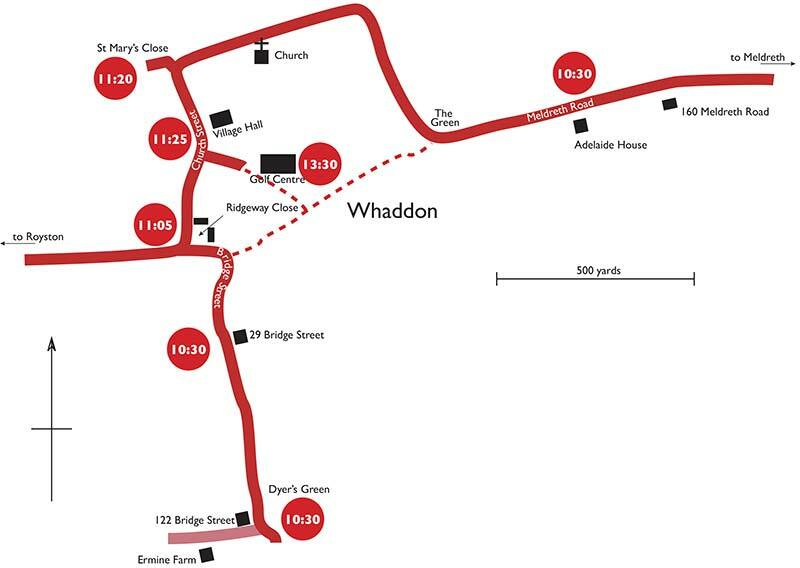 On Sunday, dancing will be happening in the streets of Whaddon from 10.30 onwards as usual. The Pentecost service in church will be at 12.30. After church, there will be more dancing at the Golf Centre, and we will include some social dancing if there is time. 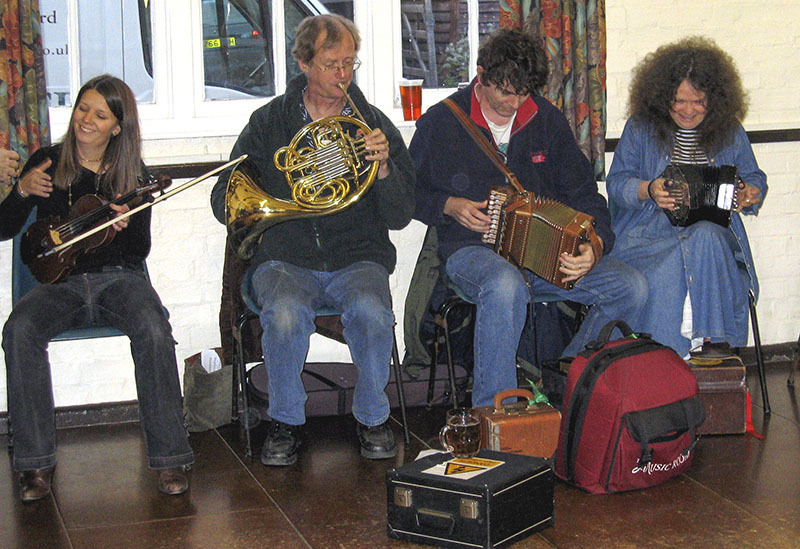 Folk Evening in the Village Hall starting at 19:30. Tickets are still available--details as above. This year we will be honoured with three Morris sides dancing around the village. These are Devil's Dyke MM, White Rose MM (both Cotswold style) and Manor Mill Morris (North-west style). Click on the map below to see a larger version. 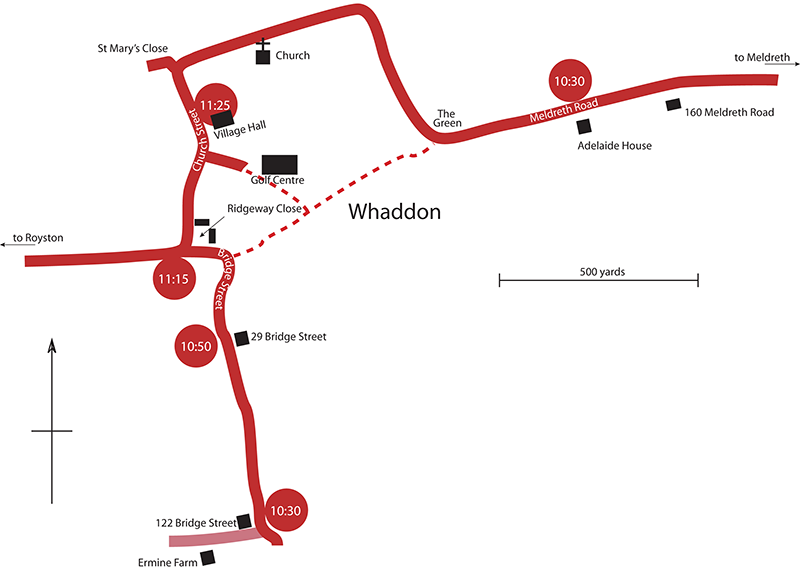 It has taken some time to finalise the events for this year's Whaddon Whitsun Weekend. Unfortunately, our good friends White Rose Morris Men have had to pull out of the event. The good news, however, is that we now have two additional Morris sides who will be with us on Sunday; however, we are short of musicians for Saturday evening so the Folk Evening will not be held this year. Instead, there will be an opportunity to enjoy the hospitality of the Golf Centre at their beer festival on Saturday evening. We hope to resume normal service next year! On Sunday, dancing will be happening in the streets of Whaddon from 10.30 onwards as usual. Please note, however, that the Pentecost service in church will be at 12.30 this year. After church, there will be more dancing at the Golf Centre, and we will include some social dancing for everyone to join in, to make up for missing out on dancing the previous evening. This year we will be honoured with four Morris sides dancing around the village. These are Devil's Dyke MM (Cotswold style), Manor Mill Morris (North-west style), and Sutton Masque and SlackMaGirdle (both Border morris style). Whitsun falls on Sunday 15 May this year! Please make a note in your diaries to support the events. On Saturday 14 May, there will be a folk evening, with music, ceilidh dancing and singing in the village hall from 7.30 pm. On Sunday 15 May, there will be dancing around the village with the Devil’s Dyke Morris Men, Manor Mill Morris and our friends from Yorkshire, the White Rose Morris Men, plus individuals from Letchworth MM and Peterborough MM. They all give their time for free to help us celebrate, so please come out and support them by watching. At 12 noon there will be a service for Pentecost in St Mary’s Church. Afterwards, there will be more dancing at the Golf Centre. Please book tickets in advance, to help assess numbers for catering: email whitsun [at] whaddon.org or telephone Helen Strudwick (207434). The map below shows the dance locations for the procession. Clicking will give you a larger downloadable PDF map. Whitsun falls on Sunday 24 May this year, which coincides with the bank holiday weekend for once! Please make a note in your diaries to support the events. On Saturday 23 May, there will be a folk evening, with music, ceilidh dancing and singing in the village hall from 7.30 pm. On Sunday 24 May, there will be dancing around the village with the Devil’s Dyke Morris Men, Manor Mill Morris and our friends from Yorkshire, the White Rose Morris Men. They all give their time for free to help us celebrate, so please come out and support them by watching. At 12 noon there will be a service for Pentecost in St Mary’s Church. Afterwards, there will be more dancing at the Golf Centre. THIS YEAR ONLY, we will not be having a Folk Evening on Saturday. Instead, events will start on Sunday morning at 10.30, with Morris dancing from both ends of the village, meeting up at the church for a service at 12 noon. This will be Donald's final service as our vicar. After the service, the festivities will continue at the Golf Centre where Ken and Iris Green are having a barbecue and their beer festival will be in full swing. There will be Morris dancing from about 1 o'clock onwards, followed by a presentation to Donald and ceilidh dancing for everyone. Come and join in the celebrations of Whitsun at Whaddon. There will be a folk evening in the village hall on Saturday 11 June, from 7.30 pm, with refreshments provided. Tickets cost £10 (or £7 concessionary price). 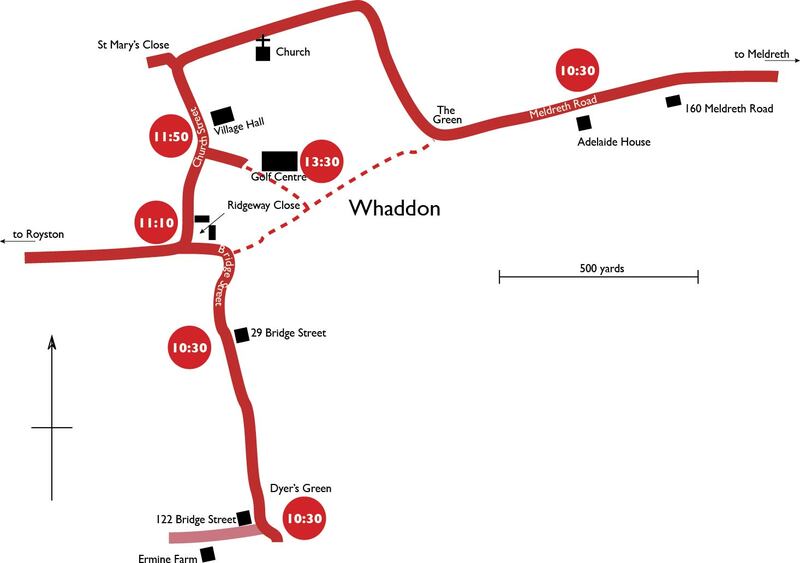 On Sunday morning, a procession of Morris dancers will start from the Meldreth end of Whaddon at 10.30 am, with another procession starting from the south end of Bridge Street at the same time. They will meet up at St Mary's Church in time for the Pentecost service at 12 noon. Dancing will continue outside the church after the service, followed by more dancing at Whaddon Golf Centre. For more information contact Helen Strudwick (whitsun [at] whaddon.org or 01223 207434). Whitsun 2010 — Another success! Helen and Nigel Strudwick would like to thank all who took part in the very successful Whitsun Weekend 2010. The weather was unbelievable, and some 70 people turned out for the Folk Evening, and many others watched the Devil's Dyke Morris Men and Manor Mill Morris as they processed around the village. Particular thanks to the Morris sides for coming, to Ken and Iris Green for their support and help, and to all who helped with the organisation! The 2010 event will be the sixth so far. A poster describing the principal events has been distributed to every house in Whaddon and to local village magazines and media outlets. The weekend has two main parts. For further information, email whitsun [at] whaddon.org. A folk evening in the Village Hall starting at 7:30pm. Tickets will cost £9/£7 concessions, and this price includes music, food and a licensed bar. The evening takes the form of a mixture of country dancing, the playing of folk music, and some Morris dancing. It also incorporates a performance of the Whitsun Song, and teaching the dance associated with the procession 'Up the Middle and Down the Sides', so that everyone knows them before the Sunday procession. Musicians are encouraged to join in, so if you play an instrument, bring it along and join in! Sellers will be visiting you shortly! You can also contact by phone the persons named on the poster for the event. Processions around the village by Morris sides taking part in the event, followed by a church service and further dancing at the Golf Centre. The processions will begin at 10:30 am, the first from Dyers Green, the second from the far end of Meldreth Road. Both will stop at various points to dance, and they will meet at the church. The church service is at 12 noon. Following the service, activity moves to Whaddon Golf Centre, where this weekend a beer festival is taking place, accompanied by a mini farmers' market and a barbecue. Here there will be more dancing by the Morris sides involved. We look forward to seeing you there. A map of the village with all these places marked will be found below. Click on the map to download a larger PDF version. 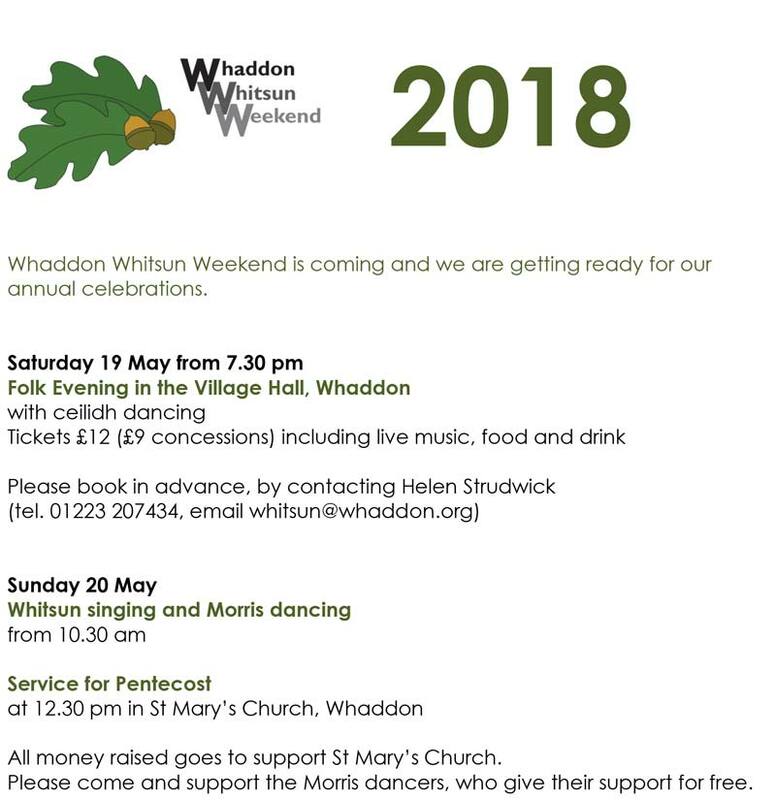 Any enquiries about the weekend should be directed to Helen Strudwick on 01223 207434, email whitsun [at] whaddon.org. 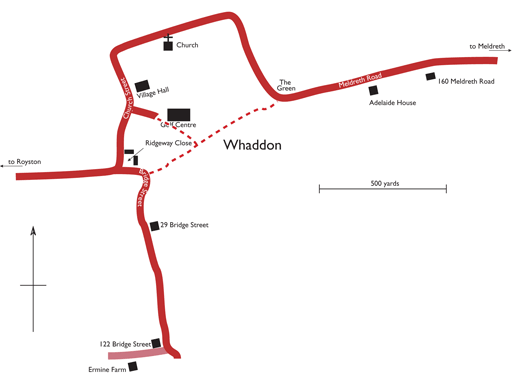 The village of Whaddon is located at the south-western edge of Cambridgeshire. It consists of a couple of hundred houses with between 300 and 400 inhabitants. My wife Helen and I moved there in 2002, and not long after our arrival we learned of the existence of the Whaddon Whitsun Song from one of our neighbours. Gradually we came to wonder whether we could revive the song through a Morris event, and so we began a search for more information. A number of sources have been consulted to try an piece together as much information as possible. These include accounts of the collection of the song by Russell Wortley and Arthur Peck, with its original publication in English Dance and Song, Wortley's subsequent researches on folk customs, local accounts of the song, and local newspaper articles. The following is an account of what has been discovered and how the song was revived in May 2005. Russell Wortley and Arthur Peck (note 1) originally collected the song in 1939 and 1942 from Whaddon resident Alfred Smith, and the music, words and an account of it were published in English Dance and Song 36:1 Spring 1974, page 20 (Vaughn Williams Memorial Library, Roud Folksong Index 3186). The song perhaps came to Wortley's attention during his visits around Cambridgeshire looking for old customs, and/or he might have heard about the special Coronation performance of it in 1937, from which much information is derived. A source of almost equal importance is a recording made in 1956. In that year, Peter Kennedy, who was recording folk traditions on tape, visited Tom Coningsby in Whaddon. Mr Coningsby, then aged 82, described the routine for Whitsun ('Whissun' in the local dialect) to Kennedy and also sang as much of the song as he could remember. This recording is sometimes mistakenly referred to as one made for the BBC. In 1937 it was decided to perform the song as part of the celebration of the coronation of king George VI in May of that year. (note 2) The singers were Alfred and Jack Smith. A photograph of the coronation celebrations shows these two elderly gentlemen dressed in top hats decorated with rosettes on the sides and long ribbons. When Wortley came to learn about the tradition, Alfred Smith told him that the procedure was as follows. The Saturday before Whit Monday the singers would go round the village and leave oak branches in the doorways (or roofs or thatches, depending on the source) of the houses as a reminder of the event which was to come. On Whit Monday the singers would walk round the village singing the song and carrying an oak branch which they waved during the last verse. They collected money which was spent that same evening on drinks for all comers at the Queen Adelaide (now Adelaide House) in Meldreth Road. From other sources we learn that the party there would include dancing, particularly a dance known as 'Up the middle and down the sides'. Of that more later. We do not specifically know that the dance was done in 1937. In the Kennedy recording, Tom Coningsby mentions that the singers would decorate themselves with up to 28 yards of different coloured ribbons. Others have suggested that they wore knee breeches and stockings, although the 1937 photographs show them wearing regular trousers. The wearing of bells has also been mentioned, and it seems most likely that the dress used before the custom ceased on a regular basis was a little different from the coronation appearance (see below on the different versions of the song). The tune as published in ED&S 36 is noteworthy for its varied tempo: at the beginning are given two time signatures 5/5 and 4/4, which half way through give way to 6/4 and 4/4. These mixed time signatures indicate the irregular meter of a song which was normally sung unaccompanied and which had to be flexible to fit an irregular word rhythm. Wortley records the song as being unique (as far as he knew) in being restricted to a single village. And then from heaven your soul shall never depart. How do you know how long we have to live? Since we have run our sinful wretched race? Pray unto the Lord that he will lead you the right way. And then in Heaven your soul shall set and sing. For that will surely bring them to shame and misery. Then the Lord he will send us all a merry Whitsuntide. These are the words as written down in 1939. (note 3) Tom Coningsby's version in the 1956 recording has 'Victoria' in place of 'our king and queen' in the last verse, which suggests that he recalled it from his younger days, rather than the version which was sung in 1937 at the coronation of King George VI and Queen Mary. Some of the words he remembered are quite different from the Smiths'; village resident Grace Pierce also remembered learning somewhat different words from Grace North, another inhabitant of Whaddon. Mrs Bland, daughter of another former singer of the song, Mr Reed, also remembered at the end of the 1950s that her father sang 'Victoria'. (note 4) Presumably the Smiths updated the song appropriately for the coronation. Coningsby and Reed's version perhaps sheds an interesting light on the history of the song. Sources who spoke to Russell Wortley in the 1960s and 1970s believed that the song had died out of regular singing between 1900 and 1910, and surely Coningsby's singing the name of Victoria indirectly confirms this by being uppermost in his mind (Victoria of course died in 1901). I wonder whether the demise of the Whitsun celebration coincided with the death of the village fiddler, whose name was Stephen Jackling, better known as 'Stibbin', and who lived at 32 Church Street. He was said in the village to be an excellent musician who played for all sorts of events. Of course it must be remembered that the song was sung unaccompanied as far as we know, but perhaps Jackling's passing made the associated merriment more difficult? Nothing is known about the origin of the song. The nearest thing to a clue is the oak leaves and branches. The mention of oak evokes the future Charles II hiding in such a tree at Boscobel House in 1651 after the battle of Worcester, and Oak Apple day, commemorating his re-accession on 29th May 1660. Could it be that the Whaddon Whitsun song developed as the local response to the Restoration, 'Merrie Englande' and so on, and the oak was adopted as a token of respect to Charles II? It has even been speculated that the original singing of the song may have taken place on 29th May, only subsequently moving to Whitsun. (note 7) Given that Cambridgeshire was such a Parliamentarian area in the 17th century, and that Oliver Cromwell himself came from Ely, the adoption of the oak branch may also have indicated a particular defiance of that regime, of which nothing more is known. Only one performance of the song has, to our knowledge, taken place in the village since 1937. Russell Wortley had paid several visits to Whaddon in the late 1960s and early 1970s to learn more about the custom he uncovered 30 years before. On 29th November 1975 Wortley gathered a number of villagers in the Village Hall to sing the song and to dance 'Up the middle and down the sides', the dance which used to be performed as part of the evening celebrations. Wortley himself accompanied the performance on the dulcimer. The event was reported on in the Royston Crow on 12th December 1975. I find it intriguing that no-one in the village has yet indicated that they were at this performance. Rather than just sing the song around the village, Helen Strudwick and I thought we would make a Morris event of the day. While the song is not at all connected with a dancing tradition, I do not need to remind readers of the importance of Whitsun time to the Morris. It was decided that the way to give the highest profile to the event was for there to be a procession of Morris sides round the village, singing the song as they walked and pausing at intervals for dancing. 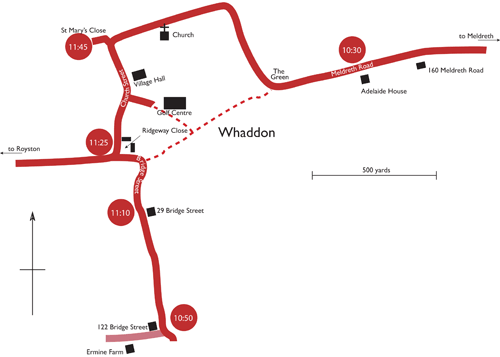 Whaddon even in these modern times lends itself to such a procession, since the village is highly linear, and one can pass every house in the core parish by following the main road (Meldreth Road/Church Street) and then turning into Bridge Street. The following sides agreed to join the Devil's Dyke Morris Men for the day: Hageneth Morris Men (Bury St Edmunds), Haughley Hoofers (Bury St Edmunds), Manor Mill Morris (Cambridge), Standon Morris Men (Standon), White Rose Morris Men (Huddersfield). There being no longer a Bank Holiday on Whit Monday, the day the song used to be sung, we decided that the event ought to take place on Whit Sunday, 15 May 2005. We also felt it important to involve St Mary's church in the proceedings. There is no evidence that there was any specific spiritual involvement in the original singing of the song, but in those days the church played a more important role in most people's lives than it tends to now. Let us also not forget that there was early on a strong connection between the church and the Morris. (note 8) The recently appointed incumbent of St Mary's, Donald McFadyen, was extremely keen for us to do this. He particularly wishes to emphasise the role of the church in the wider community, something which has been rather lost in the last 50 years. St Mary's is very centrally located in the village, and it was arranged for a short Whitsun service to take place there roughly half way through the proceedings. I mentioned that the original performance of the song was followed by a social evening, at which the collected monies were spent. We wanted to include such an event for the village, but the realities of work on Monday meant that it was more sensible to hold it the night before. We decided to call it a 'Folk Evening', done rather on the style of a traditional Morris Ale: music, dancing and singing each took their turns, and about half-way through the evening hot food was served. Excellent beer (Shannon Bitter, Village Bike) was obtained from the Potton Brewery. Music was supplied by a combination of Devil's Dyke and White Rose Morris Men musicians plus Anahata and Mary Humphreys of English Rebellion; all comers were invited to bring an instrument and join in if they wanted. About 60 people attended. We knew the evening would be good when Gordon Wood of White Rose got up to call the first dance of the evening and the whole hall stood up to join in. Clearly we had hit on a need for this sort of social event in the village. After dinner, White Rose gave a show of the Morris. Later Helen Strudwick and David Dolby of Devil's Dyke sang the Whitsun Song, after which we played the Peter Kennedy recording of Tom Coningsby made in 1956. For most of the assembled company, this was the first time they had heard such an important piece of oral/aural village history. It was listened to in fascinated silence. The records all agree that one particular dance, 'Up the middle and down the sides', was done by all present at the socials in the old Whaddon days. We know from Miss Grace Pierce, who was interviewed by Russell Wortley and also from a letter she wrote to the Royston Crow in 1975, that schoolchildren in the village did this dance in the 1920s, and Wortley's notes indicate that it was performed along with the song in the 1975 revival. But exactly what did they dance? There was enough information in Wortley's notebooks to tell us that the dance was done to the tune of 'We won't go home 'till morning' with a clapping chorus to the words 'three quarts more, three quarts more', with the dancers standing facing each other in two long lines. Hence, Helen Strudwick was reasonably confident that a progression dance to this tune would fit the bill. (note 9) The dance thus put together was performed with great enthusiasm by all concerned. Now to the Sunday. The weather was superb. With some still suffering a bit from the night before, all the sides gathered at the Meldreth end of the village from 10:00, moving off at 10:30. We had Anglia TV in attendance, and we gather that some of it was broadcast that evening; Radio Cambridge was there on the other end of the mobile phone. The Whitsun Song was sung as we processed from one dance spot to the next, and every dancer was encouraged to join in the first and last verse. As indicated in the sources, oak branches were waved in the air during the last verse. A considerable number of villagers followed along, and we had a good crowd at each dance spot. We stopped for dancing at the former Queen Adelaide, the Green, the church, the Golf Centre, Ridgeway Close, 29 Bridge Street and the bottom of Bridge Street. Each side did one dance at each spot, and the first side to dance immediately went on to the next spot where they did a complete show; this enabled every side to get plenty of dancing in. During the church service DDMM did a couple of dances, and processed out into the churchyard. For the final spot, instead of finishing with the traditional 'Bonny Green Garters', dancers and spectators got into one more rendition of 'Up the middle and down the sides'. A late lunch was then taken to end the day at Ermine Farm; during this John Jenner of Cambridge Morris Men told the assembled company something about Russell Wortley and his interest in folk customs. It was a great weekend, and we are grateful to everyone for making it such a success. (note 10) The reaction to it in the village was excellent, so enthusiastic. Collections made during the dancing were put towards the cost of the weekend and the surplus of about £220 was donated to St Mary's church. We have been asked if we will do it again. Will it be quite so special if we do it every year? I just don't know, although it would be good if at least the singing of the Whitsun Song around the village could be maintained. Ideas on a postcard please. Helen Strudwick and I would like to thank all those who danced and all those who watched. Most of the organisation of the weekend was done by Helen, and I would like to thank her for this, and for reading over this text. The event could not have been staged without great support in the village: we wish to thank Donald McFadyen and Whaddon PCC, and Ken Green and the Whaddon Golf Centre. In particular we wish to thank Clare Byatt for first making us aware of the song. Tony Gardner kindly has let us use his photographs of the day for this article. Finally, our thanks go to David Dolby for managing to teach Devil's Dyke Morris Men the song. English Dance and Song 36:1 Spring 1974, p. 20. Peter Kennedy's recording of Tom Coningsby. Folktrax International, FTX-423 The chain of gold. Songs & customs of Cambridgeshire & the Fens. Information at http://folktrax-archive.org/menus/cassprogs/423cambfens.htm; [as of February 2017 the web site is no longer taking orders]. Reviving the song that is Whaddon's own , Royston Crow, December 12 1975, p. 4. About that Whitsun dance at Whaddon , letter from Miss Grace Pierce, Royston Crow, December 12 1975, p. 4. Various entries on the song in Whaddon village newsletters and information sheets by J. Ralls. The notebooks of Russell Wortley, copies of a typed transcript of which were made available to us by John Jenner. The transcript was made by Mrs Diana Wortley (now Hillman). The original notebooks are now in the archive of the National Centre for English Cultural Tradition in Sheffield. A W.I. history of the village for a Cambridgeshire competition in 1958 (loaned to us by Karen Coningsby). I would like to thank all those who helped with the unpublished sources, and also the Vaughan Williams Memorial Library for checking the reference to English Dance and Song. Thomas Coningsby of Whaddon in Cambridgeshire, from whom this carol was collected, tells how the men of the village used to go into the woods on Whit Sunday morning, cut oak branches, and lay them on the doorsteps of all the houses. Then they would go round in a group singing this carol. And so here, as has happened in other old songs, the high moral tone of the early verses is linked with what is obviously a pagan custom. From this and email correspondence with Heather, their sources were a mixture of the Coningsby recordings and archive work at Cecil Sharp House, as the Wortley article had not been published at that time. This is very important as it is the first occasion on which this song has been used outside the village. This song may be heard on Youtube. I have subsequently discovered that the Young Tradition song has been covered by Keith Kendrick on his album Well Seasoned (2003) and Lynne Heraud and Pat Turner on their release entitled September Days (2007). It is good to know that Whaddon's song has provided inspiration for folk artists of the past fifty years. The tradition has now been running for eleven years with great success, and it has become part of the village calendar. The Folk Evening continues to be well supported, and now takes place in the luxury of the newly refurbished village hall. As the usual number of sides to attend has settled down at two or three the original procession described above has been modified for one group of sides to start at one end of the village, usually at Dyers Green, and another group to begin at the site of the former Adelaide House, and they all meet up in the centre of the village. This gives full coverage of Whaddon and fits better with the schedule. The church service continues to be the focus of the day, now run by our new vicar, Rev Dr Caroline Yandell, and the continuation of dancing at the Golf Centre is also well-attended and fun. Some of the old folks in New Close watching a cricket match--married vs single--on a Whit Monday. This was an annual event. This of course provides further evidence of the activities that happened on Whit Monday. Clearly it was a big day in Whaddon, even though, as argued above, it seems likely that the tradition of singing the song around the village may have ceased earlier than the likely dates of these photos. 1. Wortley and Peck were of course members of Cambridge Morris Men from before the Second World War. Wortley was a great collector of folk customs, extending way beyond just the Morris. 2. The coronation was on Wednesday 12 May 1937. It is not known if the celebration in Whaddon was on the same day. 3. As befits an oral tradition, there are at least three different versions of the song written down. In addition to the published version, there is Wortley's manuscript version, pointed for singing, in which a couple of lines of verse 3 do not appear, and where a word or two differs (never part at the end of verse 1, children in verse 4). The version in the W.I. manuscript has the verses in a different order. 4. Other singers known by name are Charlie Oliver, and Mr Disbrey, the latter not a regular performer. 5. K. Chandler, Ribbons, Bells and Squeaking Fiddles. The social history of Morris Dancing in the English South Midlands 1660-1900 (Hisarlik Press, 1993), Chapter 11. 6. Ribbons, Bells and Squeaking Fiddles, Chapter 10. 7. Enid Porter, Folklore of East Anglia (Batsford, 1974), quoted by J. Ralls in a Whaddon Newsletter historical note. 8. John Forrest, The history of Morris Dancing 1458-1750 (James Clarke & Co, 1999), Chapter 6. 10. A selection of photographs will be found on the Whaddon web site. I have been assembling video footage from several sources into a short film record of the event.